All of the flavor you love from fresh spring rolls, transformed into delicious Spring Roll Bowls with Sweet Chili Peanut Sauce. Happy Monday guys! I love starting the week with an awesome (and EASY) dinner idea for you. 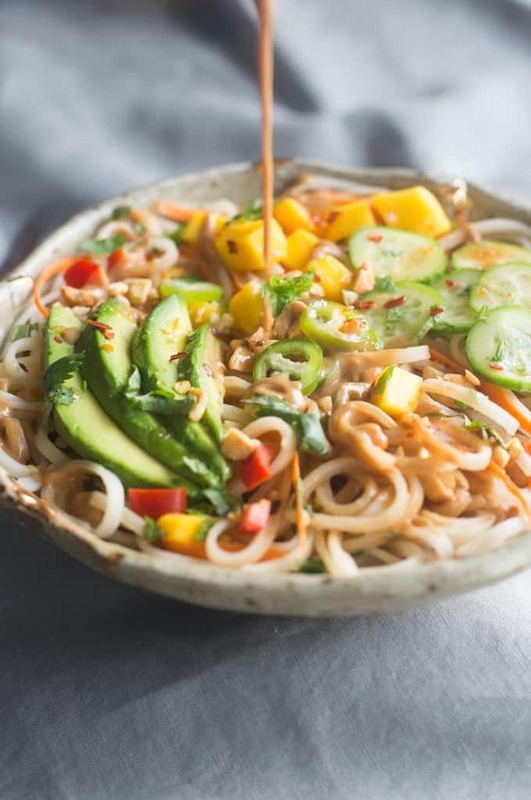 These Spring Roll Bowls with Sweet Chili Peanut Sauce are the bomb . com. This recipe was completely inspired by my friend Lindsay from Pinch of Yum. I traveled to her studio in Minneapolis recently for a food photography workshop (you may have seen some of my posts from Instagram about the #pinchofyumworkshop she does). She is amazing, not just as a person, but as a blogger and photographer too. And if you are interested in food photography her workshop is fantastic! Some of my favorite things from her recipe blog are her “bowl” recipes. If you’ve followed my blog for long you may have noticed I post bowl recipes quite often too. 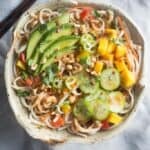 These Grilled Hawaiian Chicken Teriyaki Bowls and these Autumn Bowls are two of my all time favorites. 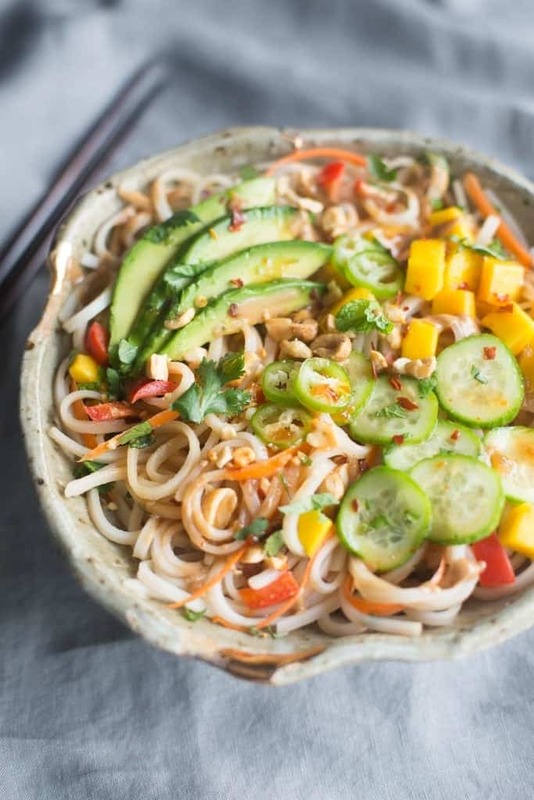 Anyways, Lindsay posted some Spring Roll Bowls a few months ago and it was one of those “ahhh” moments where I couldn’t believe I hadn’t thought of that before. I make spring rolls quite often, so I decided to transform my favorite fresh spring rolls into my own version of spring roll bowls. And, in my opinion, you just can’t have spring rolls without a delicious peanut sauce and sweet chili sauce! Not only were these bowls even easier then making spring rolls, they were every bit as good, if not MORE delicious! Add a little water, if needed until you reach your desired thinness. Slice and chop all vegetables and herbs and have them ready. Cook the noodles according to package instructions. Drain. Add noodles to a large mixing bowl. Drizzle with a tablespoon or two of sweet chili sauce and a few tablespoons of peanut sauce until well coated. Toss to combine. 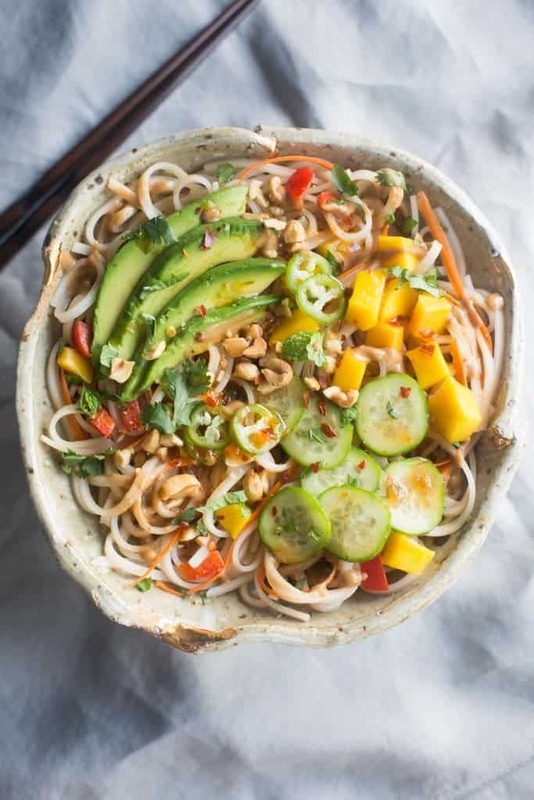 Top with sliced avocado, carrot, mango, bell pepper, serrano pepper, cucumber, peanuts and chopped herbs. Drizzle with extra sweet chili sauce and peanut sauce. Enjoy! This is my new favorite recipe. What a great blend of flavors and so many healthy ingredients!